Here’s a selection of little one-pagers or side projects I’ve built over the last few years. 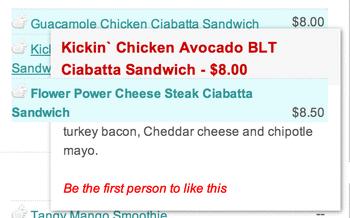 If you were a Seamless user in 2013, you probably encountered this rather annoying little bug that would display the tooltip about menu items underneath the actual menu item by not being explicit about the z-index value. I decided to take matters into my own hands and created a little bookmarklet that would fix that (and a few other minor visual grievances, like the full screen food-photography in the background). In the opening game for the World Cup 2014 in Brazil, there was a very questionable penalty call (Read more about that match here) against the guest team of Croatia. I created this site in response to this game (randomly displaying a different term of disagreement). Can you spot the Carbonmade logo…?